National Young Farmers Coalition | Last chance to get your pest questions answered! Last chance to get your pest questions answered! Crops getting hit hard this summer? Head over to the Pest Management section of the Farmers Forum to get some relief! Image courtesy of the University of Minnesota. Today and tomorrow are your last chances to pick the brain of NYFC’s two pest management experts on the Farmer Forum! The NYFC Farmers Forum is the place to find immediate answers on managing farm pests naturally with beneficial insects, traps and sprays. To date, we’ve talked about options for organically dealing with leaf hoppers (consider adding the neem-based Azadirachtin to your spraying regimen to help disrupt the molting process and to deter feeding, and then using various commercially-available fungi that will target leafhopper nymphs). We also discussed alternatives to sulphur-based treatment for more sensitive plants, cheap deer repellents and reasons, methods for limiting cucumber beetle spread and much more. Our experts are waiting for your questions! 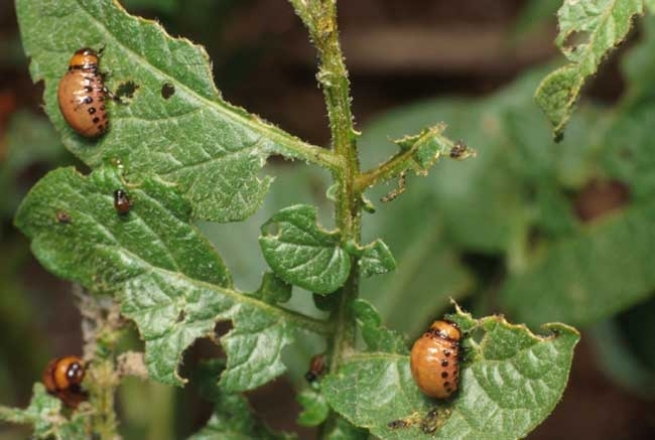 If you’ve had something bothering your plants, or have a longer-term question about how to better integrate your pest-management practices, now is the perfect chance to find the perfect solutions. Special thanks to our great pest experts: we’ve had great input from Mike Dimock, PhD and Field Director for Certis USA, and Jeff Moyer, Farm Manager at the Rodale Institute, who have been logging on to the forum to answer the questions that you pose to them! Want to ask a question of your own, or to browse the discussions already taking place? Check out the forum today! « previous article: Farmers fight back to protect SNAP – take action now!